Splice director Vincenzo Natali has two huge movie adaptations in the pipeline: William Gibson's Neuromancer, and J.G. Ballard's High Rise. 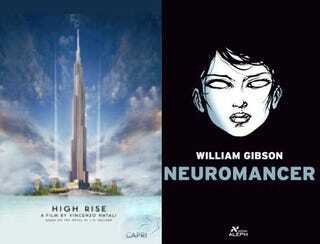 In an exclusive interview, Natali explains to us how he updated High Rise, and his hopes for Neuromancer. I was looking at the concept art poster for High Rise. I have no idea if this is based on the script you wrote or not, but the new High Rise building looks like it's not near a city. Is this film taking place on a stand-alone island? Unlike the book, which has the luxury tower positioned right outside of London? Yes. Yes. Because the book was written a long time ago — it was written 30 years ago, and it's quite surreal — I felt that if you just translated the book, just transcribed the book into a movie, basically you'd have The Exterminating Angel all over again. You'd have a surrealist film. There's nothing wrong with that, but I sort of felt that that took away from some of the poignancy of the story, when it really didn't need to be surreal. When you really can imagine this — what I call a "social disaster film." In my mind, it's totally plausible that these events could happen. But they could never happen half a mile from the port of London. So this is like the 2.0 version of High Rise? Since you're known for psychological horror, do you see your Neuromancer as a psychological horror film? Are you adapting it right now? Wait — you think you have his blessing? First of all let me say that it's a good thing for Neuromancer that those films exist. It's a good thing that Avatar exists. For a couple reasons — first and foremost, in 1984, I don't even know how people understood Neuromancer when they read it. It was just so far ahead of the curve, that even as a book, I imagine that it was very difficult for people to wrap their heads around it. Thanks to The Matrix, which obviously was heavily influenced by Neuromancer, a lot of these ideas are now a part of the popular consciousness. So when you make the Neuromancer movie, in whenever it's going to be — 2012, 2011 — you don't have to explain a lot. It's already understood, and then you can get to the really good stuff. Which in my mind is about approaching the post-human world. To me that's what the movie is about. Splice Director&apos;s Next Dream Projects: J.G. Ballard&apos;s High Rise And Alan Moore&apos;s Swamp Thing!